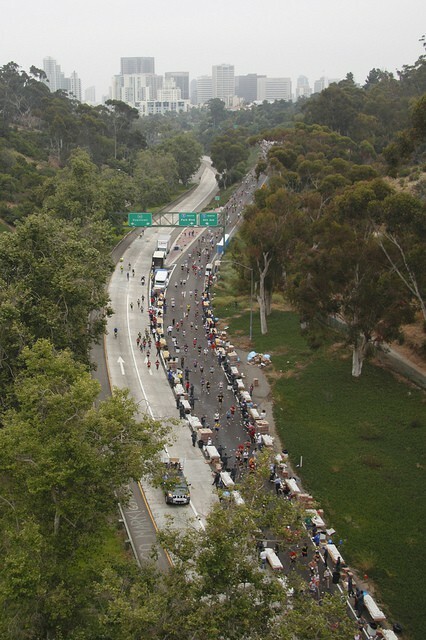 An annual early summer running tradition for the past decade and a half here in one of Southern California’s most naturally beautiful and picturesque cities, San Diego’s storied Rock ‘n’ Roll Marathon added the 13.1-mile half marathon race distance for the first time at its June 2010 running. One of the longest-running races in the history of the Rock ‘n’ Roll marathon series, the San Diego Rock ‘n’ Roll race takes runners through many of the city’s most beautiful areas. From the starting line next to Balboa Park — home to several of San Diego’s best-known attractions, including its natural history museum as well as the world-famous San Diego Zoo — the half marathon follows a winding course both through the neighborhoods north of the park, like University Heights and Normal Heights, some of which look over into Mission Valley. The race starts at the intersection of 6th Avenue and Quince Street, and follows along the same course as the full marathon for the first 8 miles. Runners will head north towards North Heights with a long stretches on 30th St. and Mountain View Dr for miles 4 to 6. Before runners reach the mile 9 marker, the full marathoners split off from those running the half, and continues on a course that will take them along University Ave west towards Mission Bay near SeaWorld. But for the half marathoners, the race heads south into the beauty of Balboa Park, where the route follows Jacaranda Place and Pershing Drive through the park, passing by the golf course and Bennington Oak Grove along the way. The race finishes close to the water on State St. The race is run also as benefit for the Leukemia and Lymphoma Society, which is well-known at race events around the country for its Team in Training programs. Nestled in the southeastern corner of the state in Southern California, San Diego is widely known for its virtually year-round sunny and mild weather conditions, which rarely rise higher than the 70s or fall lower than the 60s in the summer. Rainfall is rare this time of year, averaging less than 0.1 inches for the month of June. On race day (June 2), the average low is 61°F and the average high is 70°F. See the race route map for the Rock ‘n’ Roll San Diego Half Marathon here. To reserve your spot in the late spring/early summer 2019 running of the Rock & Roll San Diego Marathon or Half Marathon race, register online at the event website here. Ever run in the Rock ‘n’ Roll San Diego Half Marathon? Share your impressions here, or post your review in the Comments below. I missed the marathon this year. I will definitely attend next year. I am so excited. my uncle Ron will try to beat his personal best” he hopes to make it to 712 ft.
Just finished my 34th marathon last Monday at Boston – very interested in assisting your great race by being a marathon pacer. I usually run a sub 3:20 marathon, but would enjoy pacing any group between 3:45 and 4:15. Thanks for the consideration! !